The Town of Unicoi's History Committee meets the second Thursday of every month. The meetings are held at the Bogart-Bowman Cabin at 6pm and the public is invited to attend the meetings and become involved in the History Committee. 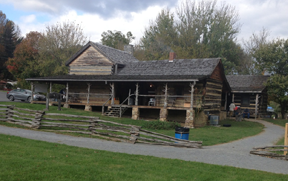 The meetings are a great time to share local history, learn history, and plan activities at the Bogart-Bowman Cabin. The History Committee participates in Town events, such as the Christmas and Strawberry Festival parades. The Annual Heritage Day is held every year at the Bogart-Bowman Cabin with partnership between the Town and the History Committee. The History Committee works to ensure that Heritage Day is a good representation of dress and activities that occurred during the era the cabin originally existed. The History Committee also plays a large role in the Annual Christmas at the Cabin. This is an Annual Celebration open to the public and is a family event. Christmas at the Cabin is a glimpse into what Christmas Celebrations were like in the late 1700s and early 1800s. The celebration consists of a candy cane hunt, visits with Santa, caroling, and the lighting of the Christmas tree.